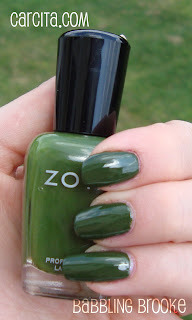 Today I have something wonderful to share with you: Zoya's new Wonderful collection! Something else truly wonderful? My fabulously amazing sister, Kelsey, did all of these swatches for me because I've been so busy mapping out my courses. Thank you so, so much, Kelsey!! (Aren't sisters wonderful?). For this fall season, Zoya came out with a fabulous pair of polish collections: Wicked and Wonderful. You can see all the sinfully gorgeous glitters from Wicked HERE, and scroll down to check out the jellies and cremes from Zoya's fall-themed Wonderful collection! Like ALL Zoya polishes, these are Big 3 Free (meaning they don't have harmful chemicals and resins), plus they are all vegan (never tested on animals). All Zoya polishes can be purchased at Zoya.com. Join their mailing list - they have tons of great offers! I used the gorgeous Zoya Kelly for THIS fabulous manicure. I love how it is a chalkboard slate grey, but with some blue tones added in. I chose these three pictures because they show how it looks in both sun and shade (the third picture shows sun on the top, shade on the bottom two nails). It is a beautiful, beautiful color and so very "fall." I used two coats for perfect coverage. Stacy is a plum wine shade composed of reds, purples, and browns. It has a nice jelly consistency and covered well with two quick-drying coats. I think it looks awesome on my sister's nails - kind of vampy! Burke feels so perfectly autumnal to me - it's like that color the leaves on that big tree in my yard turn at the very beginning of October. Burke is a dusty medium-dark red that covered nicely with two coats. This is another one that I think looks really good on Kelsey. Burke is a cool name - I've never met anyone named Burke. Cola is well, cola-colored. I don't drink soda because I have a sensitivity to carbonation (hey, that's a weird fact about me you didn't know! ), but I have certainly seen plenty of soda in my life. This is a Coke, Pepsi, whatever-you-cola-preference kind of shade: mostly medium brown with a hint of red. It covered great with two coats. I think this is a pretty cool shade! I have a very sassy friend named Kristie (with an 'e') and this is exactly her kind of color. Kristi is a bright, warm red jelly that covered great with two coats. It makes me think of chili peppers! I LOVE Shawn!! This is such a awesome army green. Just love it. Shawn covered great with two coats (the first coat was kind of weird and streaky, but the second coat looked perfect). This is a beautiful color - pictures just don't do it justice. It's green without being "woah, that's GREEN" - it's a really wearable color. 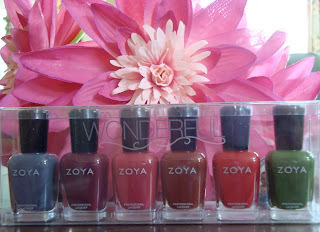 Thanks for checking out the new Zoya Wonderful collection - and thank you to my sister for swatching these shades!! What do you think of this very wonderful collection? Featured product provided by company or PR for review purposes. Great job. Zoya makes swatching easy. Thanks :) I agree - Zoyas are amazing! 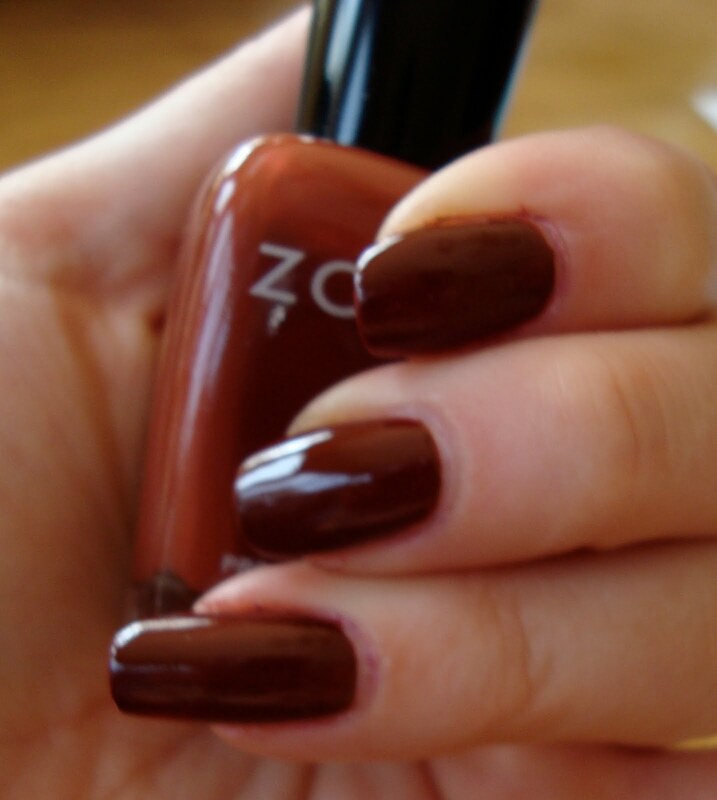 I love zoya! but honestly the colors are not doing it for me.. I think they are just ok.. maybe the stacy one is a little interesting... i might get. I liked how all of these colors were fall oriented, perfect time for the collection!! KELSEY!!! Thank you for the fabulous swatches!!! :D They look great on you!! Which one is your favorite? I like the other set better as I tend to like shimmers more but that last green.....yum! It's pretty! I'm totally into green polishes, so for me, Shawn was the standout. im so in love with zoya's kelly. id go right out & buy it but i must push through with my 4 month nail polish diet. hopefully i can still find it after november!